Crenellation, half-timbered building, hotel, Launceston, Little John, Old Brisbane Arcade, outlaw, Neil Pitt, Robin Hood, Robin Hood and Little John Hotel, shopping, Tas, Tasmania. 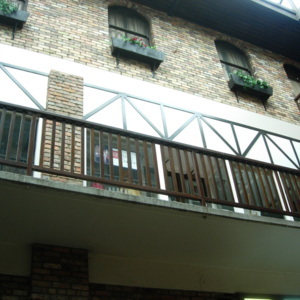 The three-level Old Brisbane Arcade was developed by Neil Pitt and can be found in the centre of the Tasmanian city of Launceston. The interior of the arcade includes a half-timbered building effect, whilst at the exterior of the rear courtyard there is some crenellation. Half-timbered buildings were common in medieval northern Europe from the twelfth century. These medieval features may be a nod towards the arcade being behind the façade of what was at one time the Robin Hood and Little John Hotel, named after the popular medieval English outlaws. The hotel had been built in 1824 and was named the Robin Hood and Little John for a few years in the mid-nineteenth century, before finally becoming the Brisbane Hotel. crenellation, half-timbered building, hotel, Launceston, Little John, Neil Pitt, Old Brisbane Arcade, outlaw, Robin Hood, Robin Hood and Little John Hotel, shopping, Tas, Tasmania. 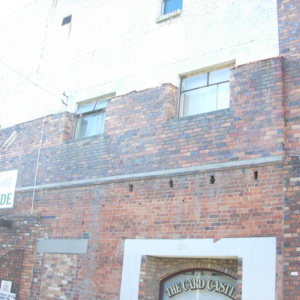 “Old Brisbane Arcade, Launceston, Tasmania,” Medievalism in Australian Cultural Memory, accessed April 23, 2019, http://ausmed.arts.uwa.edu.au/items/show/1043.